A quiet day on the Bund of Kobe. Fishermen are working in their boats moored on a sandy beach in front of the sea wall. The big building in the middle is the office of Walsh Hall & Co, located at No. 2. Founded in 1868 by American trader John Walsh and his brother, the company owned a paper mill in Sannomiya that would grow into the Mitsubishi Paper Mills. No. 2 was later sold to the Hongkong and Shanghai Bank. On the far right are the offices of the tea exporter Smith, Baker & Co., located at No.3. 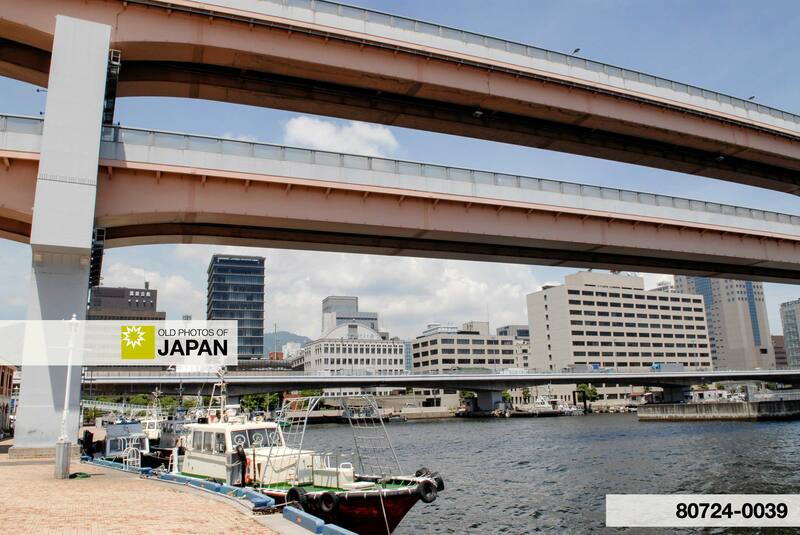 The photo was taken from American Hatoba, the pier through which once all visitors entered Kobe. It is now an invisible part of Meriken Park. 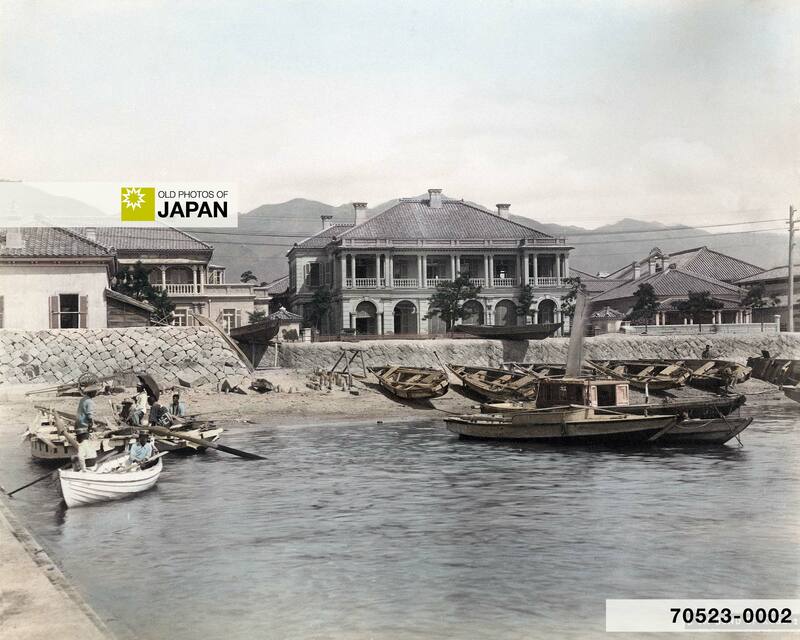 When Kobe, or Hyogo as it was still called in those days, was opened to foreign trade on New Year’s Day 1868, there was nothing but a barren sandy area that was flooded during heavy storms. Difficult to imagine now, as today it is all concrete and asphalt, but fishermen used to haul nets of iwashi (sardines) here on beautiful beaches. “The merchants aboard their vessels were gazing at the sandy waste that was to be their home, and at the long sandy beach, lined for most of the way with old gnarled pine trees, that stretched towards Osaka. They were contemplating with some misgivings the intense amount of work that would have to be undertaken to raise the level of their settlement, to make it safe from invasion by the sea during typhoons, and to turn a barren sandy waste into a mercantile centre. As the merchants awaited their appointed hour of landing, their thoughts turned to the problem of accommodation. This detail shows the beautiful colonial design of Walsh Hall & Co. Notice the gas lamp between the two trees (right behind the boat). Because water flowed down from the mountains as well, the area was waterlogged and full of quicksand. On this improbable location, the English civil engineer John William Hart eventually built an elegant European style settlement, with roads, gas lamps, brick sewers and parks. He, and the foreign community that settled in his town, did a wonderful job. Soon Kobe was referred to as the Model Settlement of the Far East, far more relaxed and safe than Yokohama, where during the first years after it was opened to trade, a long string of fear-inspiring murders took place. One multiple murder, the Namamugi Incident, even resulted in the bombardment of Kagoshima in 1863. Kobe experienced two scares in 1868. On February 4, samurai from Bizen (today part of Okayama Prefecture) clashed with foreigners. Although nobody was killed, the foreign settlement was in a state of siege for several days. The worst incident happened a month later when 11 French sailors were killed in Sakai, on the other side of Osaka Bay. After that, Kobe quieted down and it remained that way. 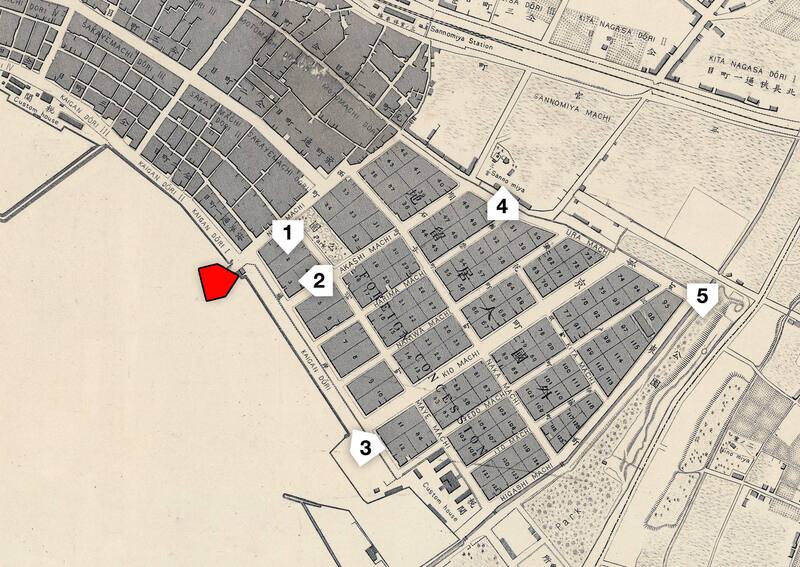 Many of the Hongs (trading houses) had their compounds on the Bund. From their offices and storehouses wafted smells of tea, spices and silk-waste.3 Japanese, Chinese and Western employees, speaking myriad languages, walked in and out. Goods were delivered by handcars or were taken to tall ships from the West. Countless small Japanese boats maneuvered through the harbor. The views, the smells, the sounds. They all blended together into something unique that could only be found in the foreign concession. It was undoubtedly an exotic place to visit. During the 1920s, the seawall was torn down, part of the harbor reclaimed and the street widened. Over the years more reclamation and construction followed. The former Bund is now far removed from the sea, and the once beautiful view on the bay is today obstructed by buildings and elevated highways. Map of the “Kobe Former Foreign Settlement” from Terry’s Guide to the Japanese Empire, 1920. 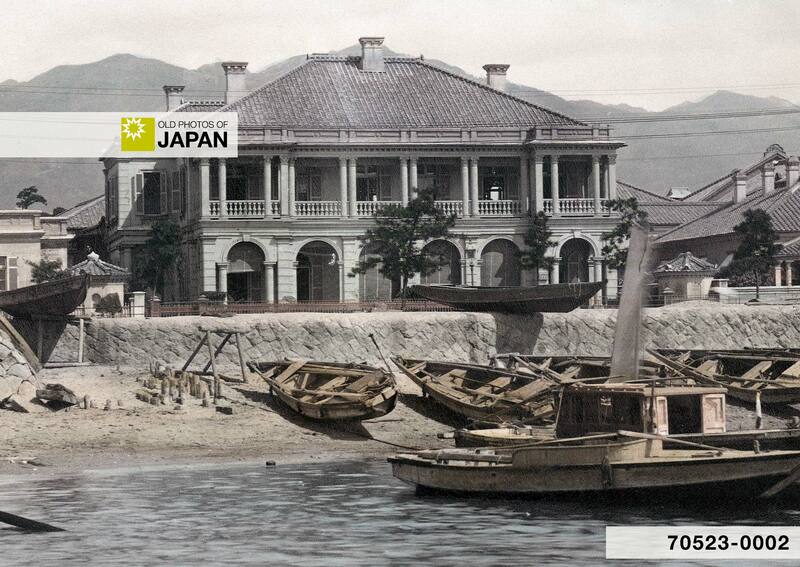 This map shows Kobe more than 20 years after the photo was taken. Although the lay-out remained pretty much the same, there has already been a lot of land-reclamation from the Custom House and the Kobe Club down. The photo was taken from “American Hatoba” and shows the buildings on lots 1, 2 and 3. You can also licence this image online: 70523-0002 @ MeijiShowa.com.